Dive deep into Icelandic food culture as you prepare, cook, and eat the most authentic food known to Icelanders, Slátur. 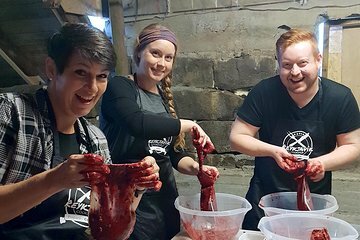 Get messy as you make both blood pudding (blóðmör) and liver sausage (lifrarpylsa). Enjoy a tasting platter, including fermented shark, rye bread, and other tastes unique to the Icelandic palate. Tour the farm and meet the local animals before you sit down to the meal you’ve prepared.